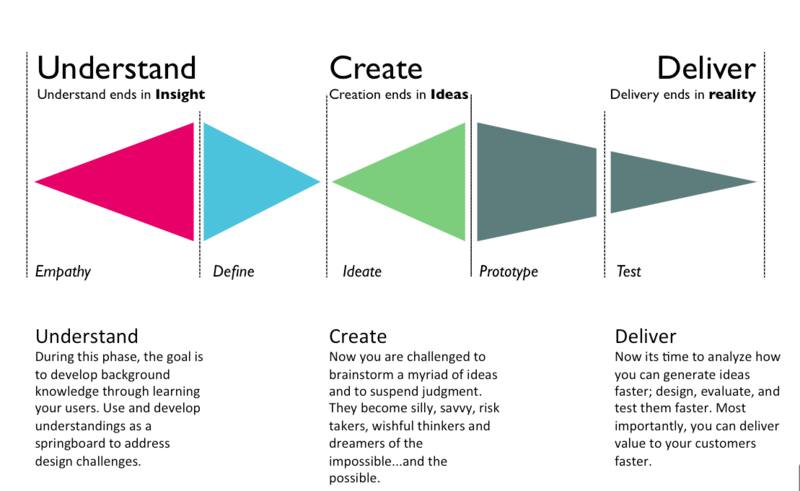 Design Thinking is a proven method to shape innovation creatively. Innovation is about new solutions, new ideas and their realization, and creating an unique value. That value is not so much the technology, product or service, but especially in the experience of the customer / user. They are experiencing value through the use of products and services to achieve their goals. Therefore defining what is value is increasingly a co-production between provider and customer. What role does a product of service have in this changing landscape? And how can an organization reinvent itself? Can a industry or department (e.g. marketing) also innovate itself? Design Thinking is one way to find an answer to these questions. Below are the steps Trndmrkr uses to come to an answer. Having a open-minded,active and creative mindset is indispensable. However, it is not a religion or a linear process. The steps can occur simultaneously and be repeated. It’s all about understanding the story and finding the red line”. For more information what Design Thinking tools can do for your challenge, contact Trndmrkr.